Astonishing case mods are usually the domain of PCs, but consoles occasionally get some love. 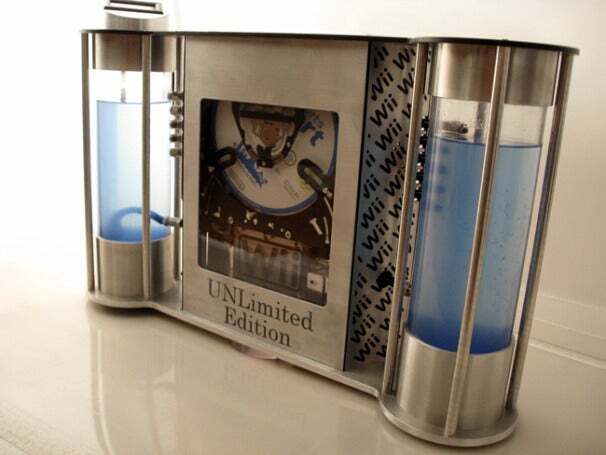 Check out this impressive "UNLimited Edition" Nintendo Wii mod by Martin Nielsen aka Angel OD. There are a few impressive things about Nielsen's mod--it's wall-mounted, it uses water-cooling to keep the system running smoothly, and Nielsen even went to the detailed extent of machining the Wii logo into the water block and into the side of the case. There's also a digital thermometer on top of the case, to make sure the system doesn't overheat. Nielsen's entire build log is at bit-tech.net forums. The precision that went into this mod is especially cool--you'll see Nielsen not only removes the Wii drive, he also cuts it and spray paints it black to make it all pretty-like. The system can be wall-mounted, but Nielsen's mounted it to the side of his subwoofer using pins. Forum user Yaka wonders whether the vibrations (of the subwoofer) will affect the DVD drive, but Nielsen says he "only plays Wii Sports" anyway, so it (hopefully) won't make too much of a difference. The grand unveiling is on page six. Yeah, this guy's basically taken a plastic console and turned it into wall-mounted, water-cooled modern art.